YOUNG LADY: Wait! – First the drudgery, the drudgery of keeping the filth of life away. Dirt is the castoff element of creating order. In fact, for there to be order, there must be disorder, just as an interior is defined by the presence of an excluded exterior. In Strindberg’s metaphysics, the purity of a good, eternal life has its shadow component in the filth of the earthly world. The Student enters a house believing it to be paradise. Instead, he finds it is a hell, and it stands in metonymic relation to the fallen world all around him. But it is also linked to its antonym, the heavenly house above. One can become the other, the Student tells the Young Lady – the pitiable earth can become a paradise — but first it is necessary to get their house in order. The Young Lady complains of all the chores she must perform. While to modern ears she may seem hopelessly whiny, it helps to understand that these characters are seeking to rise above life in a real spiritual sense. In order to do so, The Young Lady must plow through the drudgery, the dirt of daily life, and yet each day her work is undone. No matter how much dirt she shovels out of the house, she finds it back on her floor in the morning. Just as the Young Lady is poisoned at the source of life (Strindberg’s notes suggest her illness may be uterine cancer or syphilis), so the temporal world contains dirt as a mark of its formation, a gene expressed in all of its constituent parts. She wastes away while getting no closer to a clean house. Purity recedes from her grasp. Among Strindberg’s many obsessions was the esoteric field of alchemy. He considered himself an amateur scientists and dedicated great quantities of time to experiments of his own devising. Strindberg the alchemist knew dirt to have potential value. One of the central quests of alchemy was the discovery of a means of turning base metals into gold. Understood symbolically, this is the mission to transform the earthly body, with its dirt, into the purified soul. 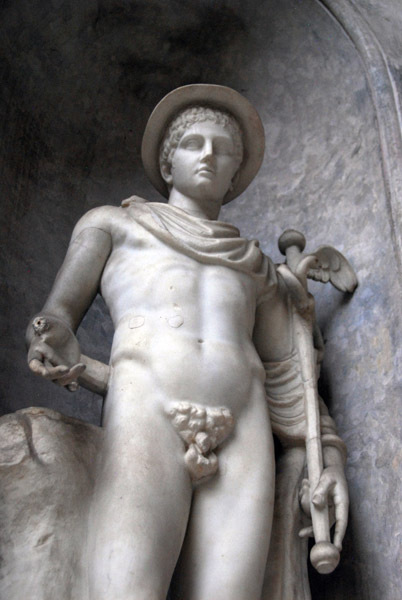 The symbolic god of alchemy is Hermes (who operates as a shadow-Christ according to Jung), and Hermes has the ability to bridge the gap between worlds. He is a god of crossroads, negotiating the way between spaces like the gap separating the ordered house in paradise from the disordered house the Student enters. So rather than treating the action of The Ghost Sonata as simply the struggle to remove dirt, it may be profitable to view it as an effort at alchemical transformation. The question is what ingredient is needed to redeem the base materials. Suffering and repentance says the Mummy. Patience and work says her daughter, the Young Lady (the contrast here almost seems to play upon a Catholic/Protestant theme). The Old Man tries sunlight, or truth. His surrogate son, the Student, begins with love then abandons that for another go at truth. Arguably, the final passage represents a third change of tactic for the Student, though what precisely that might signify is bound up in questions about his ultimate success. Note, though, that a precursor to the Student’s campaign of truth is his attempt to banish the Cook. The Cook, a vampire and servant, is associated with the kitchen and the foul stuff of life. She cannot be got rid of. In fact, as a vampiric presence, it is curious that she arrives when she does. The Old Man, a vampire, came to expose the dirt of the house to the light of truth and was defeated by the darkness within himself (“wrathful deeds which you have done cannot be cured with hate and strife”). But the house will not be without a vampire, and so the Cook enters the scene to fill his vacancy. The Young Lady appears to perish behind the death screen, just as her father did at the end of scene two. She does so after a harsh exposure to the truth. The Old Man’s hanging is followed by a chilling moment of prayer: “It is consummated,” the Mummy says, in Paul Walsh’s translation, “may God have mercy on his soul.” Frequently, this line is rendered in English as, “It is finished,” drawing a clear parallel to Christ’s dying words. If you’re up for a quick comparative mythology spin, be aware that the Old Man is associated with Odin, of Norse mythology, by way of the textual references to The Valkyrie, and that Odin gained wisdom by hanging himself from Yggdrasil, the world-tree, in a famous example of what Frazier identified as the hanged god image. The most famous hanged god – also on s symbolic tree? – Jesus Christ. And yet the Old Man does not rise again, except possibly manifested in the new vampire, the Cook. That would be an infernal rebirth; in the Buddhist reading Strindberg invites, a lower reincarnation. Out of dust he is made and to dust he returns. What of the Young Lady? When she passes behind the screen, the Student continues his prayer for intercession (in fact, she calls for the death screen immediately after his line “Savior of the world, save us, we perish!”). He goes on, asking for her peaceful deliverance until suddenly the harp begins to play spontaneously, and “the room fills with white light.” A miracle, it seems. But why? And of what kind? 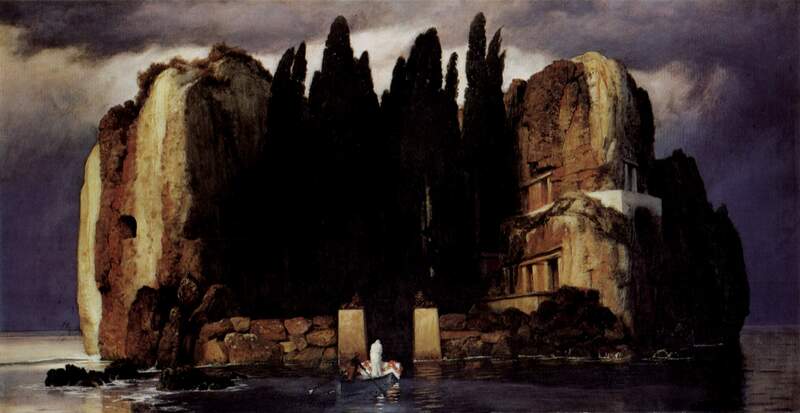 Strindberg’s stage directions call for Böcklin’s painting, The Isle Of The Dead, to be displayed as the room disappears at the end of the play. The symbolist painting shows a boat approaching a sepulchral island, defined by stone cliffs and dark, towering cypress. In the boat are a shadowed oarsmen, a standing figure in white, and a polygonal object usually understood to be a coffin. Böcklin portrays a soul ferried to the gates of the Underworld (a journey in which Hermes plays a role, remember). Combined with the music of the harp and the white light, it is fair to interpret this as the Young Lady’s passing on to an after-life. Unlike her father, she has escaped from the foul world into the pure one. Alchemically, what ingredient, or process, has changed? What became of the dirt? Is it something about the Student’s prayer that allows the Young Lady to be transformed? One might credit the intense exposure he subjects her to with burning away impurities, except in the midst of that terrifying passage, the harp is dumb and will not play. That can only be the beginning of the procedure (it may, however, be a necessary start: it’s hard to see how she can be transformed without first dying, and the Student’s attack certainly appears to kill her). This interpretation may not be wholly satisfying. The Young Lady’s wasting sickness remains a troubling manifestation of dirt, a lingering consequence of sin, and it is not entirely clear why her inherited dirt should be more easily redeemed than the filth the other characters have arguably chosen. To return to the alchemy metaphor, the Young Lady’s patience and work (the ingredients she combines with the base metal of life) are necessarily futile, and her innocence a passive choice at best. If disorder is a condition of the world, should it matter that she has yet to commit the sins of the older characters? Is her infection different in kind or only in degree (she’s only innocent, after all, because she’s young and mostly keeps to her room)? Still, this appears to be the direction of Strindberg’s argument. She is purified, washed clean of this world, because the dirt was never truly hers. Once she has suffered enough for it, she undergoes mutation and passes on into the heavenly house, that “home without dust”, in an eternal, unchanging world.